Well, my night was awesome (and delicious!). 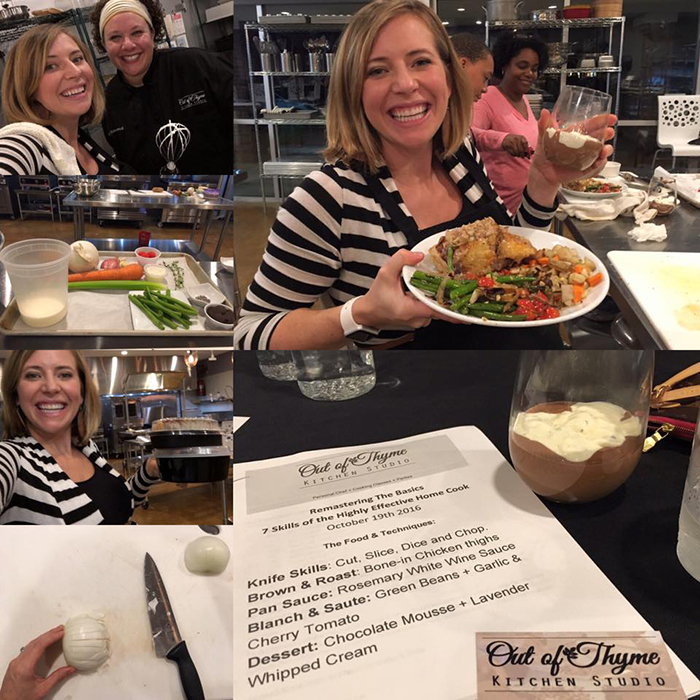 To prep for being homebound with a newborn again soon, I decided to take the “7 skills of a highly effective cook” cooking class tonight at Out Of Thyme Kitchen Studio and it was incredible! In two hours, I learned everything from knife skills and mincing like they do in the cooking shows, to blanching/shocking, searing, and making homemade whipped cream/mousse. There were people there by themselves, couples, best friends and a mother/son — all different levels, but everyone learned something and then ate together at the end! So fun! Oh and don’t worry Pete, I’m bringing home lots of leftovers! Haha!